The long rains start end of March and run through to the end of May. Northern Tanzania sees most of its heavy in rain during the short rains in November, which are normally dry by the start of December. Best time to visit is either June through to early November, or early December through to end March. The wildebeest migration is most active throughout the year. The coastal areas are best visited between August and end March. Southern Tanzania is best visited between June and October. December through to May remain wet and logistics complicated. Tanzania is situated in East Africa. It lies south of Kenya, and is characterised by a coastline, a sizable section of the Great Rift Valley, a handful of mountains and by a central plateau that levels out at about 1,500m. While old hands will tell you that Tanzania can be visited at any time of the year, choosing when to travel will be dictated by climate, area and interest. Climate-wise, Tanzania has a tropical climate, an average daytime temperature of around 25°C, and receives an annual average of 892mm per year. However, it is a large country, with a latitudinal stretch of 12°, the south generally being much drier than the north, and is best understood as 4 distinct climatic zones: the coast, the central plateau, the northern, western and central highlands, and the lakes and mountains of the Rift Valley regions. Influenced by position and altitude, and by the oscillating rain bringing effects of the Inter-tropical Convergence Zone (ITCZ) and, to lesser extent, the Congo air mass, most of the country experiences a bimodal precipitation pattern, with the short rains taking place in November – December, the long rains in March – May. This pattern is most apparent in the north and along the coast, becomes less pronounced in the interior, and collapses in the south – into a single rainy season, from late November through to March. As a rule of thumb, when we speak of the climate and its effects on wildlife, it is true to say that game viewing is best during the dry season, when the animals are forced to exploit fewer sources of water, and when the land is parched, dry and brown. During the wet season, the animals are afforded greater cover, are more widely dispersed and therefore are much more difficult to spot. Conversely, many experienced travellers and specialists prefer the wet season: the game is in better shape; it is when many species calve, and behaviour changes; and it is the time for watching birds. However, unless a specialist, very experienced or a bird watcher, January and February and June through to the end of September are the best times to travel. The roads are better, the nights cooler, game drives easier. This said, it is worth noting that predicting the climate – and therefore the related behaviour of game – is becoming an increasingly tricky occupation throughout eastern Africa. Droughts and floods are occurring with greater frequency, and climatologists today tend to look as much to the effects of the El-Nino Southern Oscillation (ENSO) as they do the ITCZ and local topographical factors when attempting to forecast annual weather patterns. Cold ElNino episodes result in prolonged drought, while warm episodes produce heavy out of season rains, leading to floods. Areas most affected by the ENSO are the arid and semi-arid climatic zones, where annual rainfall levels range between 200mm and 600mm. Finally, in terms of understanding the different areas of travel, Tanzania is best broken down into zones: the northern, western and southern safari circuits, and the coast, which in effect means the Zanzibar archipelago and one or two mainland spots. The Tanzanian Northern Circuit proper stretches from the eastern shores of Lake Victoria to Arusha town. Demarcated in the north by the Kenyan border and in the south by Maswa Game Reserve, lakes Eyasi and Manyara and by Tarangire National Park, it includes Serengeti National Park and the Ngorongoro Conservation Area. To this we have added the northern mountain circuit – Arusha National Park, Mount Meru, Mount Kilimanjaro, Mkomazi and the Usambara Mountains. The Serengeti The Serengeti plays host to the annual migration. With an elevation of between 900 and 1800m, an annual temperature range of between 21°C and 27°C and a precipitation range of 950 to 1150mm, the area’s climate – in normal years – is temperate and experiences a bimodal rainfall pattern, with the short rains occurring in November and December, the long rains in March – May. The Serengeti is not blessed with large numbers of permanent water sources: the migration follows the rain, its quest good grass and high quality water. As the rains move south – between October and January – the migration can be found first above the western Loliondo and Lobo Hills area (October), then a halfway down the eastern corridor, in the Nyabogati and Ngare Nanyuki rivers areas (November and December), before arriving in the south east, in the Ngorongoro Conservation Area (January and February), where it spends the short dry season. From here it gradually moves west and – between April and June – north, following the long rains, and can be found on the Grumeti waterfront (June / July) and massing along the Mara River (July / August), before crossing the border into Kenya. The south and south east is the most popular area of the park, its short grass plains habitat the epitome of what everyone imagines the Serengeti to be. The plains are broken only by small rocky hills (koppies) and the occasional strip of riverine habitat. Everywhere else is grass. The combination of short grasses and poor tree cover makes for excellent viewing, even during the rains. In the north of the park – characterised as it is by acacia woodland, riverine habitats and intermittent tracts of grasslands – the wildlife disperses during the rainy season and is consequently that much harder to spot. The same is true of the western corridor, though the migration’s main river crossings generally take place during the long dry season. The Ngorongoro Crater and Conservation Area Approximately 8,300km2, the Ngorongoro Conservation Area’s main points of interest are the Ngorongora Crater, Olduvai Gorge and the fact that it is the epicentre for a Masai culture that – despite the problems of drought, modernity and population growth – continues to endure. 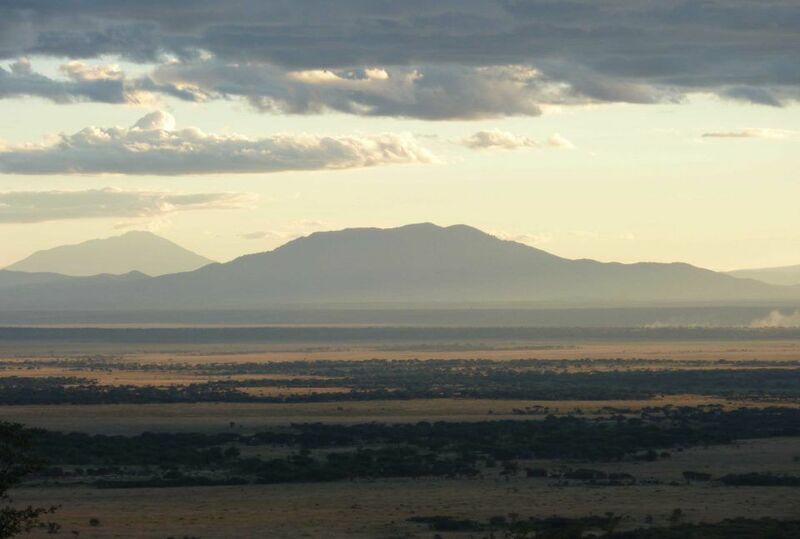 The Ngorongoro Conservation Area has an altitudinal range of 960m to 3,648m, its climatic zones ranging from semi-arid to montane forest, all of which accounts for its widely ranging levels of precipitation (from under 500mm to 1700mm) and for the fact that temperatures oscillate between 2°C and 35°C. 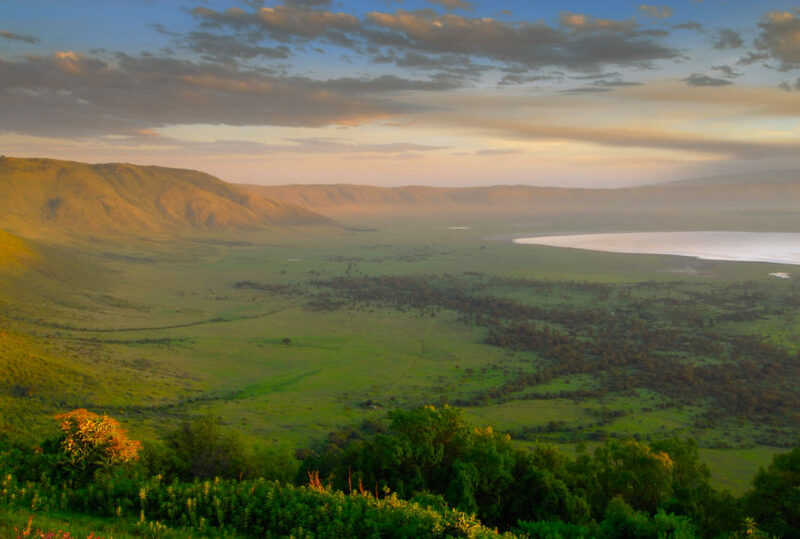 The Ngorongoro Crater is – at 260km2 – the world’s largest volcanic caldera. At an altitude ranging between 1700m (the crater floor) and 2,235m (the crater rim), and subject to the vagaries of the easterly trade winds, rainfall levels depend on height and position, with the forested eastern slopes receiving between 800mm and 1500mm a year, the crater around 700mm and the western slopes 400 – 600mm. Average annual temperatures range from 14°C to 25°C, the crater floor much hotter than the rim, which is often swathed in morning fogs and, depending on the time of the year, can be anything from warm to chilly to freezing at night. Fed by the Ngorongoro’s highlands, the crater floor’s habitat possesses a number of permanent water sources, making it less than dependent on its own levels of rainfall, though the western plains are particularly dry during February and between June and September. Consisting therefore of a microhabitat that includes a saline lake, swamp, plain and forest, the crater sustains a resident population of 25, 000 animals – including elephant, lion, wildebeest, zebra, buffalo, hyena, leopard and rhino. While the adage dry is best still holds true, the rain here tends to arrive in the afternoon, and takes the form of short and violent storms, thereby allowing for reasonably unaffected morning game drives. Nevertheless, January and February and June through to early October remain the most comfortable months during which to view game. Olduvai Gorge and surrounding environs is semi-arid, receives 566mm of rainfall a year and averages out at a temperature of 22.8°C. The rains here are particularly unpredictable, and temperatures regularly soar into the early thirties. The main dry season is long, the rainy seasons limited to April and May and November. The beginning and end of the year is hotter, but only marginally, and the nights chilly (which accounts for the relatively low mean temperature of 22°C – don’t be fooled: it can get extremely hot during the day). Tarangire National Park receives an average of 650mm of rain a year, has a bimodal precipitation pattern, with the long rains occurring in March – May, the short rains in November and December. It is especially hot between November and the beginning of January, with temperatures peaking around 29°C, and the nights are warm. While daytime temperatures rare fall below 25°C, the nights are considerably cooler during the long dry season. 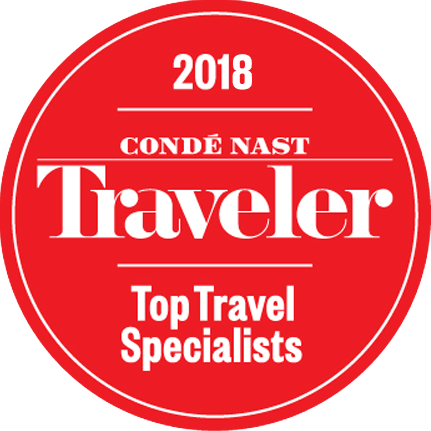 Best visited during the dry season, when much of the game is concentrated around the Tarangire River, the park’s wildlife either heads northwest or disperses across the Masaai Steppe during March-May and November and December. While this pattern holds true in normal years, it is complicated by the unpredictable nature of the short rains. If they are very light, or fail entirely, the game tends to stick to the river, rather than risk travelling through draught. The result is an extended dry season, and therefore more excellent viewing, but for the animals these are the desperate times. With herbage sources in around the Tarangire River all but exhausted, grazers are forced to travel further for less, are weaker and therefore that bit more vulnerable to carnivores. With an average of 778mm ofrain per annum, and an average temperature of 25°C, Mkomazi National Park has a semi-arid climate. Subject to a bimodal precipitation pattern, the long rains occur in March – May, the short rains in November and December. With its only source of permanent water being the Umba River, the movement of its wildlife is influenced by the rains. Best visited during the dry season, Mkomazi’s wildlife disperses between March and May, and in November and December. *This said, recent research shows that the park is naturally susceptible to swinging between extreme low and extreme high rainfall periods, a long term cycle that will obviously affect the movement of the area’s wildlife. Arusha and Mount Meru Arusha is the northern circuit’s arrivals and departures, and services both the Serengeti and Kilimanjaro. At 1400m it is both relatively cool and wet. Temperatures average out at 19°C and the town and surrounding area receives in the region of 1052mm of rain a year. March – May and November and December are the rainy seasons, April by far the wettest month, and January – February is mildly wet in good years. Late May through to October is very dry. Given the relatively low levels of precipitation during November and December, October through to February is the best time to visit nearby Arusha National Park and to climb Mount Meru. · At 800 – 1800m, the mountain’s base is heavily cultivated, experiences an average temperature of 27°C. · Between 1800 – 2800, the mountain is heavily forested, receives 2000mm of rain a year and is home to a range of wildlife, most of it very well hidden, whatever the time of year. The temperature decreases by one degree for every 200m climbed. · The vegetation changes dramatically at 2,800m, from forest to moorland, and temperatures decrease from around 22°C – at the forest-moor fringe – to a relatively cool but manageable 16°C at 4000m. · An alpine desert habitat constitutes the next 1000 metres. Here the temperature ranges between 15°C and 10°C, but can drop to 5°C during cold spells, and the area receives no more than 200mm of rain a year. -10°C and 10°C, and at night can fall into the minus twenties. Average rainfall is 100mm. Above 4500m, the mountain is not subject to the area’s climatic patterns, and so the weather is unpredictable and fast changing. Clearly, in terms of preparation, climbing Kilimanjaro is more than a trek, involves a certain amount of risk, and requires that climbers are well equipped and fit, and that they are guided by experienced professionals (see Mount Kilimanjaro for further information). Usambara The Usambara Mountains are situated in the north-east of Tanzania. Over 100 kilometres long and 60 wide, they range from 1,600m (Lushoto town) to 2,440m, with the wettest areas receiving 2000mm of rain per annum. Like much of the rest of the north, the Usambaras are subject to a bimodal rainfall pattern, with the long rains occurring in March-May and the short rains in October and December. Divided – by the Lwengera River – into east and west, the Usambaras provide excellent hiking and bird watching opportunities, with the Amani Nature Reserve and the Mazumbai University Forest considered the most significant ecological zones. While best visited during the dry seasons, the west and northern facing slopes are in the mountains’ rain shadows and receive just 600mm a year, making them perfectly accessible during the short rains. Temperatures decrease the higher one goes, and there is a chance of mist during March and May. At the moment (2011), Journeys by Design designs Tanzanian coast based itineraries that incorporate the Zanzibar archipelago, Mafia Island and – on the mainland – Dar-es-Salaam and Ras Kutani. Climatically, the mainland coast, the Zanzibar archipelago and Mafia Island are all influenced by the Kaskazi and Kuzi monsoons. The first of these, the Kaskazi blows in from the north-east during the months of November to March inclusive. Reasonably benign, these relatively dry winds, though warm, help mitigate the effects of an otherwise very humid atmosphere. The second monsoon, the Kuzi, lasts from April through to September, and brings with it the long rains, which last from April through to June, with April being the year’s wettest month. The short rains, though present, are less significant, and occur between October and November. It is hot wherever you are, mainland or island, with the maximum average temperature being 29.3°C, and the months between October and April reaching into the early thirties. These temperatures are further fired by the levels of humidity, which peak in April (87%) and November (76%), adding muggy and very hot to the list of adjectives with which one could go on to describe the coast based rainy seasons. The long dry season, June through to September, is less humid (60%), the nights more temperate. While the temperature is constant throughout the area, precipitation levels differ, with the mainland receiving an average of 1,100mm per annum, and Zanzibar between 1,500mm (Unguja) and 1,820mm (Pemba), while Mafia gets as much as 2000mm. Most of the rain falls between March and May. Its quality is heavy, and it can rain every day for two months, which is why many lodges tend to close during this period. The shorter rains are much more manageable, and occur in the afternoon and night, leaving the rest of the day clear and bright. The best time to visit the coast would be any time between June and the end of February, which is also when the sea is at its calmest. With the Kuzi giving way to the Kaskazi, visibility is excellent between September and March, making this the best time to snorkel and dive. Fishing is similarly good between September to early December and February through to April, with the tuna season being August – October and billfish marlin mid-November through to March. The south proper includes the south coast, the southern highlands and Lake Nyasa (also known as Lake Malawi), Rungwa and Selous game reserves, Kilombero Valley and the national parks Mikimu, Ruaha and Udzungwa. Away from the safari circuit, and for the moment (2011), the south coast remains an alluring but distant and underdeveloped destination, while the highlands and Lake Nyasa, though beautiful and well worth a visit, fall outside the Journeys by Design remit. Nonetheless, it is worth knowing that Lake Nyasa is hot, humid and the recipient of a staggering 2000mm of rainfall per annum; and that the south coast receives around 1000mm a year and, like the north, experiences a bimodal though somewhat unpredictable precipitation pattern. Of the wildlife areas, it is Selous Game Reserve and Ruaha National Park that receives the majority of our custom. The Selous Game Reserve is situated in the very south of Tanzania. Huge and watered by Rufiji River, it has two distinct ecological zones: grasslands that dominate north of the river and – to the south and constituting 80% of the park – miombo woodland. Ranging from semi-arid to humid, the park experiences a single rainy season, from mid-November through to April, with yearly average levels of precipitation 750mm to 1,300mm. East is drier, hotter and temperatures range between 17.9°C and 37.3°C. The park becomes steadily wetter the further west one goes, and temperatures drop slightly (14°C-36°C). On paper, the rainy season in Selous spans 6 months, but it is a slow starter, builds gradually and only really gets going late December. In a normal year, June and November are the buffer months – June being dry but relatively green, December seeing the beginning of real rain. In terms of viewing wildlife, peak season is July through November, when it is very dry, the cover next to useless and when the animals mass along the river and remaining water sources. Bird watching is best between December and April. Smaller and situated north-west of Selous, Ruaha National Park is fed by the Great Ruaha River and is the centre of an ecosystem spanning 50,000km. Like Selous, it straddles two biomes – savannah and miombo – and as such is home to diverse and healthy populations of animal. 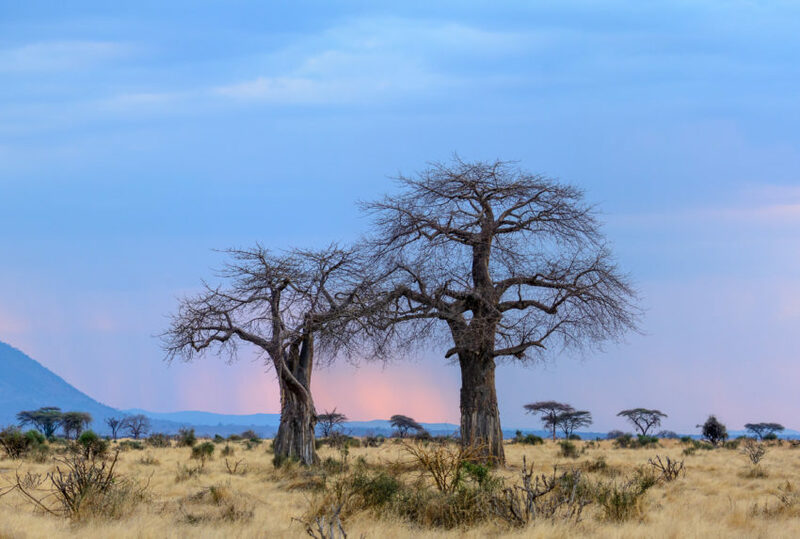 It is, however, much drier than Selous, receiving on average 500mm of rain per annum; and it’s also hotter, with temperatures ranging between 15°C and 40°C, the coolest month being June, when daytime temperatures hover around the 30°C mark. All of which means that Ruaha is genuinely arid, and much more vulnerable to drought than Selous. The dry season – May through November – is long, hot (but not humid) and is the best time for game, while January through to April is good for bird watching. The western safari circuit takes place against the backdrop of Lake Tanganyika. It includes Mahale Mountains National Park, Gombe Stream National Park, Ugalla Game Reserve, Uwanda Game Reserve and Katavi National Park. At the moment (2011), Journeys by Design designs itineraries for Katavi and Mahale. Mahale Mountains National Park is situated on the shores of Lake Tanganyika, about half way between the Burundi and Zambian borders. The lake itself lies at 730m, but the park’s highest point is 2,462m, which accounts for the presence of 4 ecological zones, beginning, in the foothills, with mixed open canopied woodland and followed by a small band of rainforest, Afro-montane forest and, towards the top, moorland. There are two seasons: rainy and dry, the rainy season lasting from October to April, the dry season from May to September. Rainfall levels fluctuate according to altitude and position. The west is much wetter than the east, with the lake and shore receiving 1,500mm per year, the higher parts between 2000mm and 2,500mm per year. On average, the area receives 1,800mm per year. Temperatures range from 18°C to 32°C. It is generally hot and humid, even at lake level, especially during the rainy season. The best time to view Mahale’s primates is between July and October, when cartloads range through the lower slopes, and when it is dry, the going easy. Katavi National Park lies south of Mpanda. Little known, little visited, Katavi is a dry season park of the highest order. There seems to be some discrepancy as to the annual precipitation pattern, with some authorities claiming a unimodal pattern, others bimodal. In reality Katavi experiences one rainy season, November to April. On average, it receives 930mm of rain per annum, most of it in the wet season. At this time the game is dispersed, elusive and very difficult to spot. More, the park is genuinely uncomfortable, the roads impassable, the air muggy, the nights stiflingly hot. Conversely, the Katavi dry season is cooler and much less humid and makes for much easier travelling. The cover is greatly reduced, seasonal lakes and rivers are all but dried up and the game masses along the Katuma River, presenting viewers with a litany of extraordinary sights.